I love bread. It is so satisfying to make — and to eat. 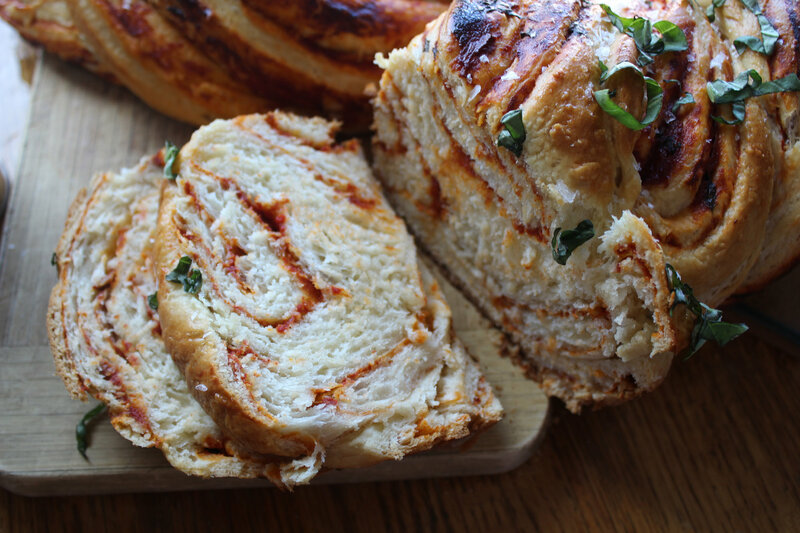 Filled loaves take bread to another impossibly delicious level. 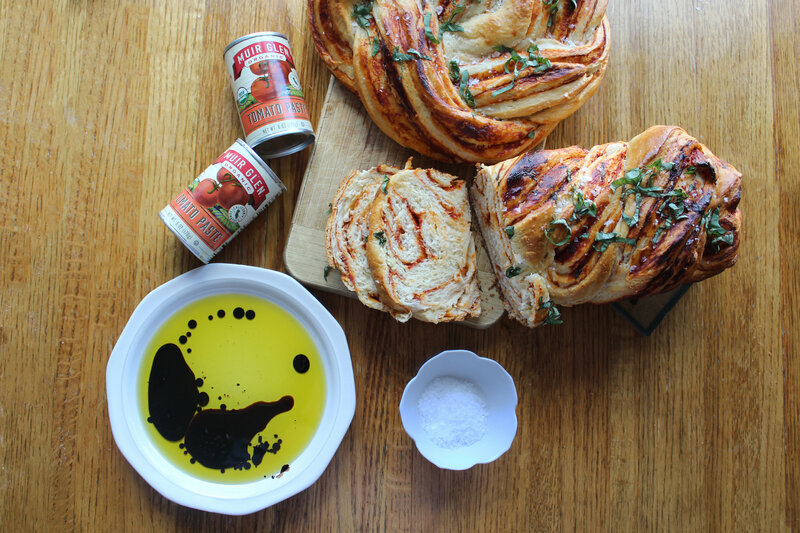 Imagine a fluffy, soft, enriched dough, filled with an extremely flavorful combination of tomato, roasted garlic, and basil, shaped into beautiful loaves. This easy yet impressive crowd-pleasing recipe will steal the show at your next gathering. All of the ingredients for this loaf came from East End Food Co-op in Pittsburgh. I love to use local and organic ingredients in my bakes, as well as supporting a great organization that does so much for my community. Find your own local co-op using this store locator! 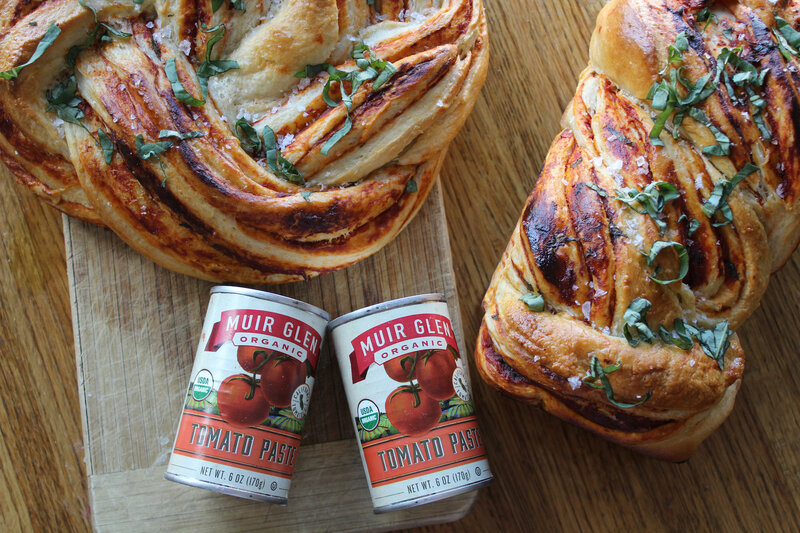 I chose to use Muir Glen Organic Tomato Paste in this recipe. Not only is it the most flavorful tomato paste that I have ever used, I love that Muir Glen grows organic tomatoes and has a commitment to maintain a zero waste policy and to protect our natural pollinators — bees! This recipe will make two gorgeous loaves, and I’ve provided two ways to shape them. 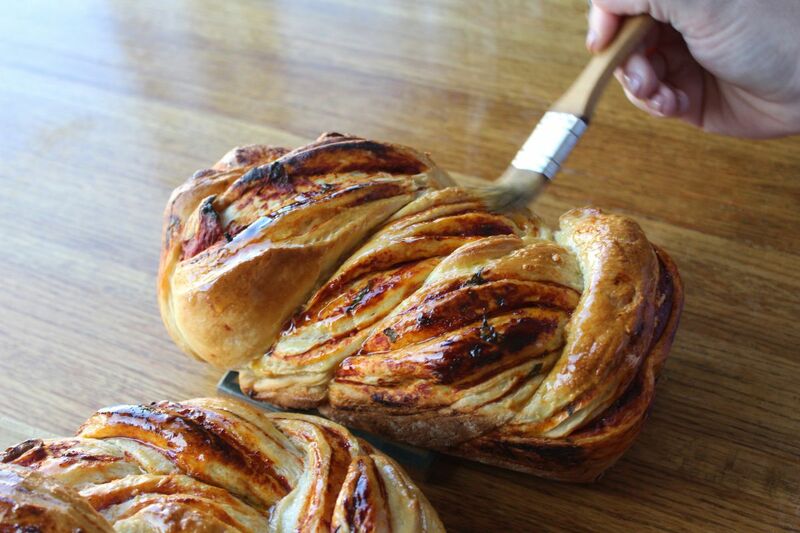 You could easily half this recipe to make just one loaf. Cool scalded milk to warm, below 100 degrees. Sprinkle yeast over top. 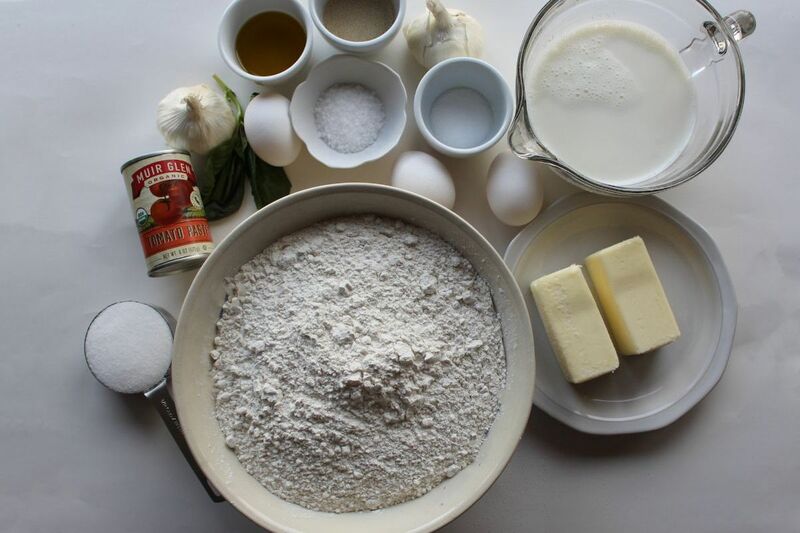 In a stand mixer with a paddle attachment, combine butter, sugar, and salt, and beat until fluffy. Add eggs and yeasted milk. It will be very liquid, so begin to add flour. Once about half of the flour has been added, switch to the dough hook attachment. Once all the flour has been added, continue to knead dough with the bread hook for about 10 minutes, until the dough is soft, pulling away from the sides of the bowl, and can stretch without breaking. Cover the dough with a clean tea towel and leave in a warm place to rise until doubled in size, about 1 hour. Meanwhile, make the filling. To roast garlic, preheat oven to 400 F. Peel the garlic cloves, and place in an oven safe dish. Drizzle with olive oil, add a sprinkle of salt, and cover with foil. Bake for about 20 minutes, until garlic is soft and fragrant. 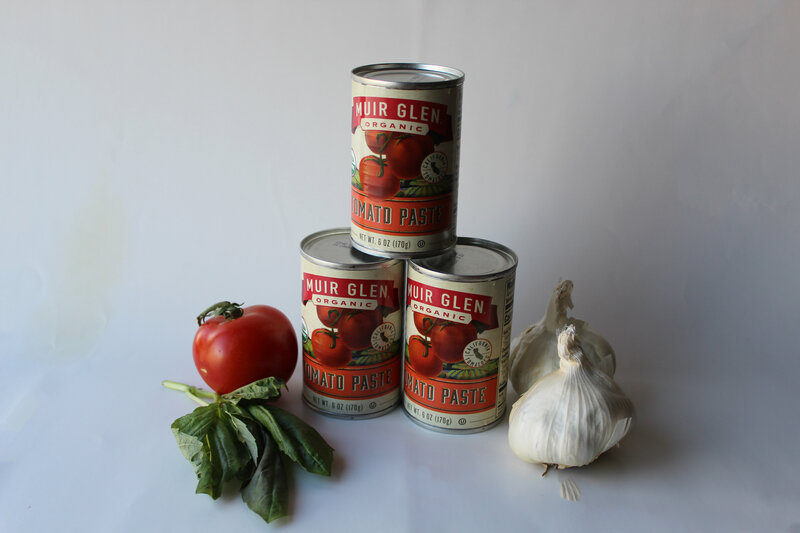 In a separate bowl combine one can of Muir Glen Organic Tomato paste with roasted garlic. You can use less garlic based on your preferences. Add fresh chopped basil, and salt and pepper to taste. Once dough has finished proofing, turn out onto a floured surface. Divide dough in two. 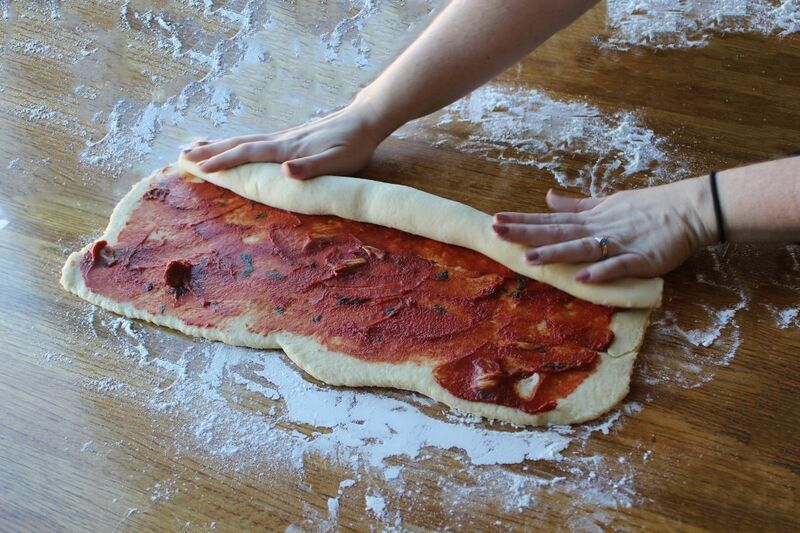 Roll out each half of the dough to a large rectangle, about 12 in by 20 inches. Spread half of the filling on each rectangle, making sure it is evenly distributed. Roll each rectangle into a sausage. Using a very sharp knife, cut the roll lengthwise from top to bottom. Twist each half around each other. If using a bread tin, line the tin with parchment paper. Tuck the ends of the loaf under itself and place in the tin. Cover with a tea towel and leave to rise again, about 30 minutes. If making free form loaves, transfer twisted dough onto parchment paper. 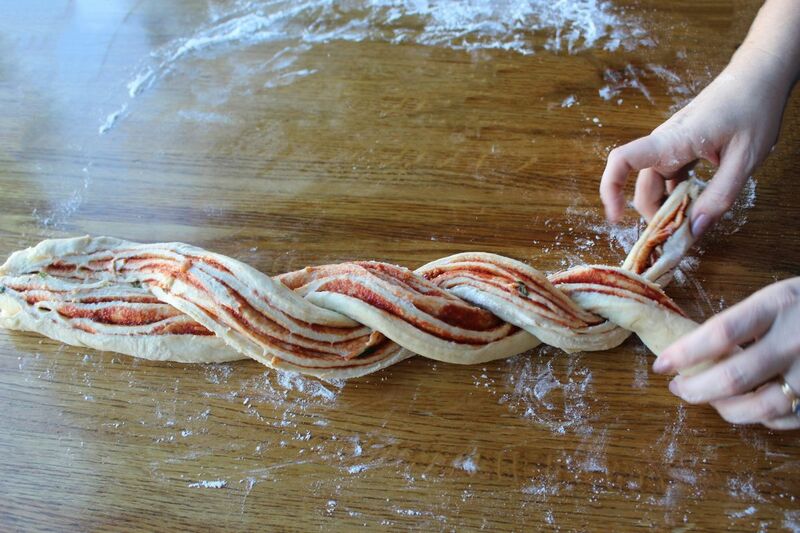 Begin forming the twist into a circle, tucking the end under the loaf. Transfer parchment paper onto a cookie sheet, cover with a clean towel, and leave to rise again, about 30 minutes. Preheat oven to 350 F. Combine one egg with two tablespoons of water. Brush egg wash over each loaf. Place loaves in oven, and bake until golden brown, about 40-45 minutes. Once loaves are out of the oven, brush each loaf with olive oil. Sprinkle fleur de sel on each loaf, for an added crunch, and more fresh chopped basil. Serve by itself or with oil oil and balsamic on the side. You can see video instructions for this recipe on my Instagram stories!